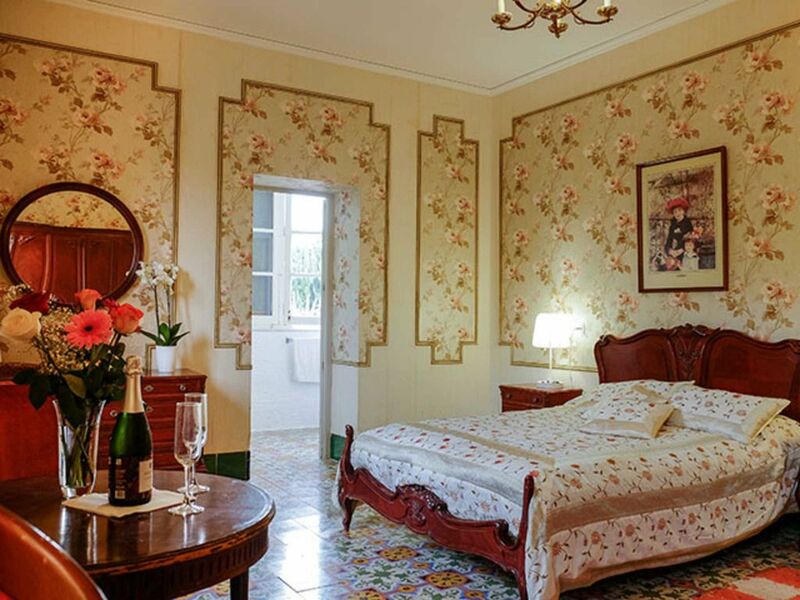 EL GRECO- Superior Single Room With elegant furniture in antique Spanish design, old paintings, beautifully tiled floors and a private bathroom, this sumptuous room looks like an aristocratic bedchamber. Large windows flood the room with light, and there is a beautiful, large, comfortably furnished terrace with a beautiful view of the lush palm garden. Enjoy the air conditioning, in-room refrigerator and free Wi-Fi access. A single bed or baby cot can be delivered on request. Relax in our beautiful villa, enjoy the large swimming pool, the lush palm garden, romantic BBQ areas, meditation, yoga. Relax in your comfortable room and enjoy a wonderful view from your large and comfortably furnished terrace to the beautiful lush palm garden and the powerful mountain of Montgó. Our aim is to create a place that is more than just a guest house. A place where guests are directly touched by beauty and nature. Enjoy our warm and dedicated service. Between the sea and the mountainous national park, it is an ideal place for hiking, climbing and cycling and to relax on the long rocky and sandy beaches. With us you can borrow free bicycles to explore the area! The crystal-clear water is ideal for swimming, diving, snorkelling and kite surfing. The villa is located between Valencia and Alicante, on the northern part of the Costa Blanca. It's worth the beautiful town of Denia to explore and enjoy. Denia also has a beautiful, old fishermen's quarter, Baix la Mar, which is a beautiful, historic labyrinth of narrow streets, small squares and cozy cafes. A long sandy beach, popular with both Spanish and foreign tourists, is located along the city Denia and gritty, as we move down the coast. The crystal clear water is ideal for swimming, diving, snorkeling and kite surfing. The historic port of Denia with its waterfront restaurants is full of life and many interesting boats. Daily ferries (with car transport) to Ibiza and Formentera allow for easy travel to these wild and beautiful islands. The mountain Montgó and its surroundings is an impressive natural park. A mountain rising seemingly high out of the sea and touched the clouds. The Montgó and the wooded park at its feet have an extraordinary variety of flora and fauna and have become a symbol of the great biodiversity of the region. On different routes around the Montgó, on clear days you can enjoy the local flora and fauna, the panoramic views of the coast and its surroundings, and sometimes even views of the islands of Ibiza and Mallorca. In addition to a golf course in Denia, at the foot of the mountain Montgó, there are 14 other golf courses in the area between Valencia and Alicante.